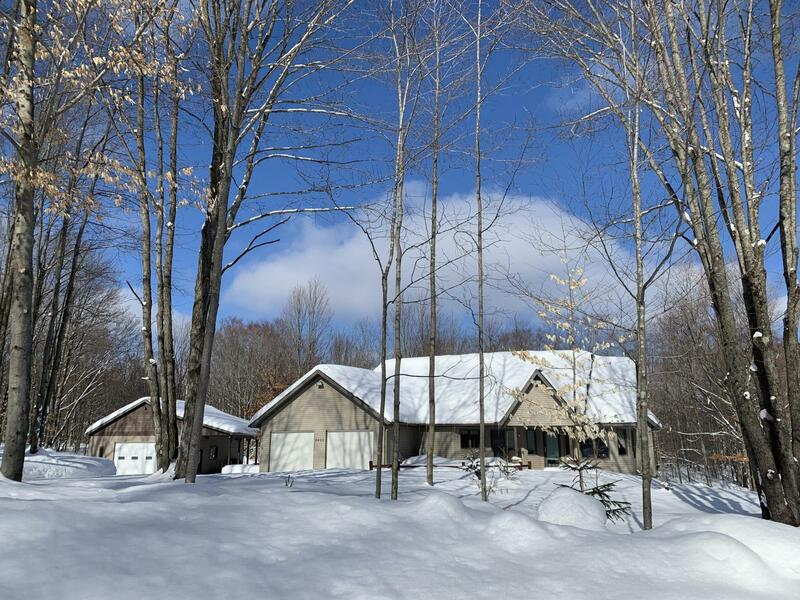 SNOWMOBILERS AND GOLFERS this 4 bedroom home with finished walk-out lower level is perfect for you. Vaulted ceilings, custom stone gas fireplace in living room, hardwood floors and French doors in formal dining room. Spacious eat-in kitchen boasts of hickory cabinetry, tile floors and newer appliances. Main floor master suite with door to deck and hot tub. Walkout lower level has knotty pine and 1/2 log walls, pellet stove with hearth, custom tile floors, custom pine bar, kitchenette, wood laminate floor in rec room. 4th bedroom with 1/2 bath and sauna. Home is situated on 3 professionally landscaped lots with irrigation, field stone accents and a unbelievable 30 x 40 man-shed with overhang, in floor heating, 1/2 bath, water and 9ft. front and rear overhead doors, This is a Must See!